This post builds a bit on the last one. I’m not sure if it’s just that I’m paying more attention during this trip, but compared to any other country I’ve ever visited, Australian nativism seems to be a bigger deal here than anywhere else. What I mean is this: “Australian made” is stamped on everything that it could be possibly stamped on. It’s on food, on consumer goods, on cars, everything. It’s most obvious on food, and most ridiculous too. 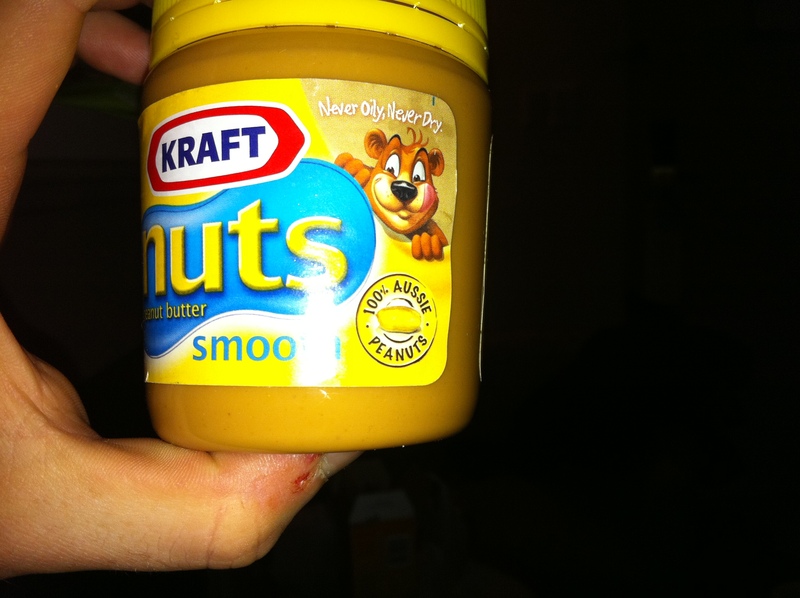 The picture below sums it up–Kraft is certainly not an Australian brand and this shouldn’t be fooling anyone. But someone thinks it’s a good idea to put “100% Aussie Peanuts” on the jar. They must think they’re appealing to someone. Perhaps we’re just not looking in the right places. I wonder what this is all about. If you have to ask, the answer is always money. You might be over-thinking this. Given that Kraft is unambiguously a foreign-import, isn’t the marginal-cost of putting the “Made in the AUS” label on there worth it, even if it only activates a small number of people to buy the product who otherwise wouldn’t? We were out looking at cars (er,…mini-vans) yesterday, and I was at the Honda dealership. The “fact-sheet” in the window of every new car includes detailed information, in pretty big font, about how much of the Honda was actually made in the United States, what percentage of the parts were made here, etc. I know cars are different that peanut butter, but that strikes me as just about the same thing: an obviously foreign product (at least in the sense that the return on capital profits generally head out of the country) trumpeting that it’s ingredients are domestic. BTW, did you see the U.S.-Brazil soccer game today? unreal. @Matt: oh I totally agree…what was lost in my post is that I think that *except for the US* I’ve never seen anywhere where “Made in Country X” is so important. So the USA and Australia are similar, and differ from everywhere else. The point about the marginal cost of putting “Aussie Peanuts” on the packaging is spot on, but (just guessing) I don’t think that anyone in Germany is putting “German pork” on their sausages. They are putting “Munich pork” or whatever. Saw highlights of the game, but looked incredible. Makes me wish I had a daughter so I could get her fired up about sports. I can’t attribute it to nationalism or even rooting for a team — we hadn’t even discussed yet which “color team” she liked better. But it did tell me something about soccer: the combination of the game being easy for a 3 year old to understand (it’s the only team sport Anna unambiguously understands the objective of) plus the rarity of the goals is going to hook kids faster than, say, baseball. That’s for sure.